Starting a worm bin is probably the cheapest, most widely available option for many of you. We decided to give it a go to prove how easy it can be. It only cost us $30 and took about 2 hours. Drilling holes and shredding the bedding took the longest, but if you have some help, it’ll be done in no time. 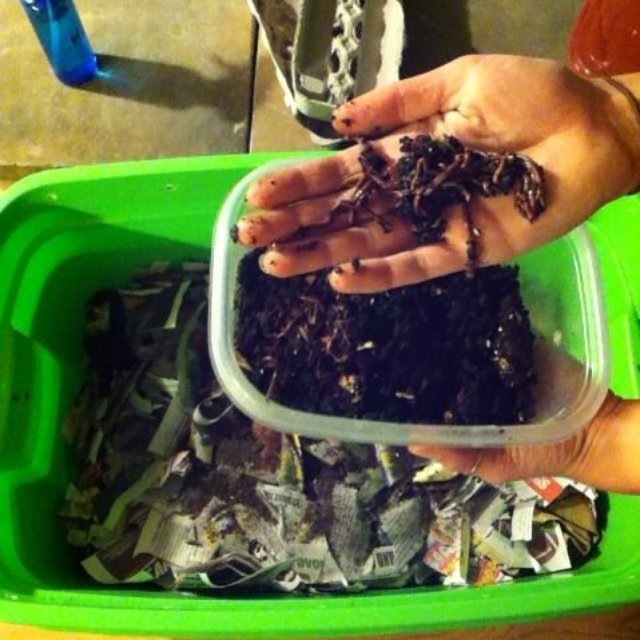 Vermicomposting is easy and will be wonderful for your garden. 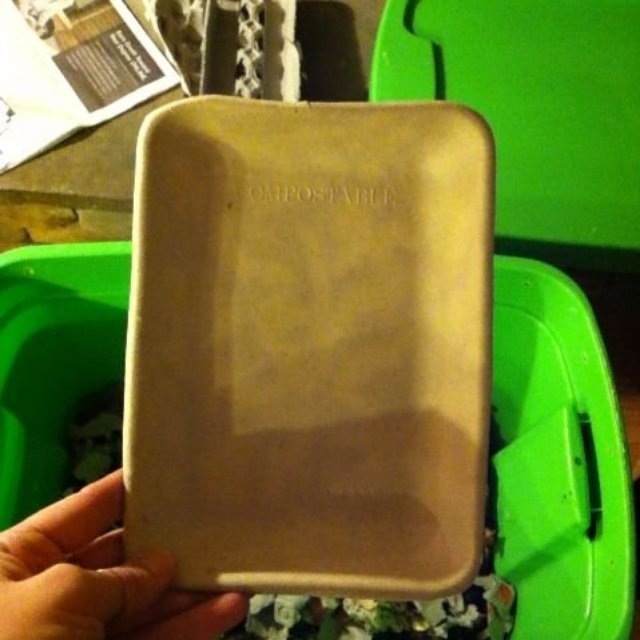 1) Two opaque Rubbermaid bins. We used two 18 gallon bins because we expected to have a lot of worms and food scraps. They cost us about $5 each from Home Depot. 2) Drill with a 1/8” drill bit. 3) Dry material like cardboard, newspaper, paper / compostable products. Provide some relief to your recycling bin and let your worms recycle these items for you. Don’t have any on hand? Travel to the nearest coffee shop and take some “junk” off their hands. Fruit and veggie scraps, egg shells, coffee grounds & tea bags are great. Things like citrus, onions, spicy and starchy foods should be added in moderation. Avoid adding meat, oily items, and dairy. Worms have preferences too… We store up food scraps in the CompoKeeper and feed the worms a bunch of stuff all at once. 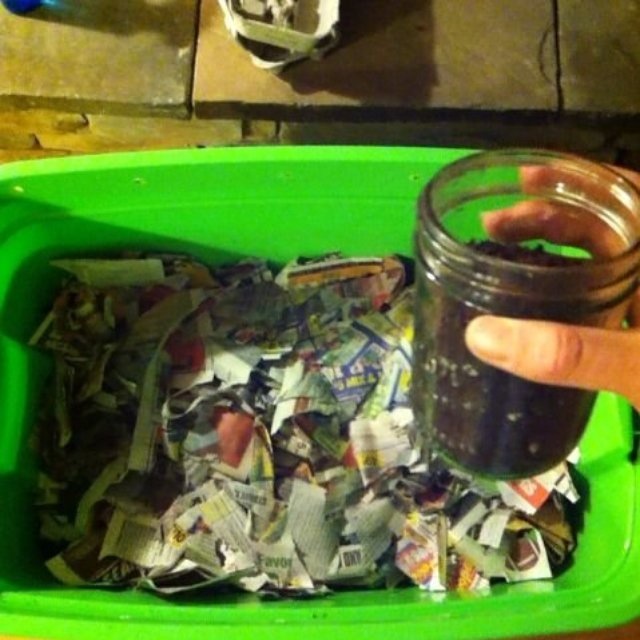 Feeding the worms also helps keep your kitchen compost bin from getting too full. 5) Water . 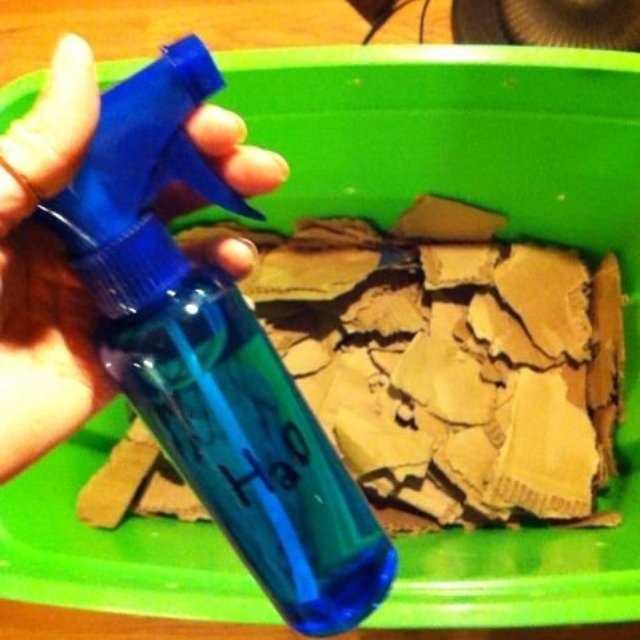 Use a spray bottle to keep the materials moist. We bought one from the grocery store for $2 but you can also reuse an old cleaning bottle, just make sure to rinse it out really well so you’re not dousing the worms in chemicals and poisoning your compost. 6) Two supports to create space between the stacked bins and allow air flow and moister drainage. 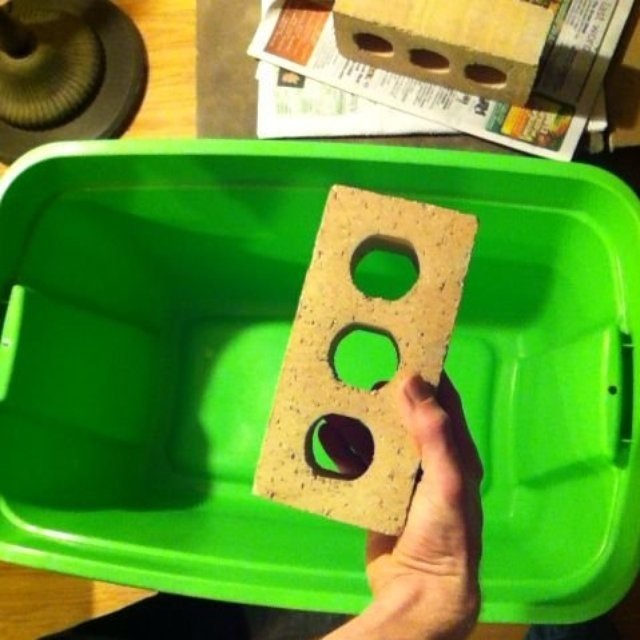 We used some old bricks I found outside. Be resourceful here, anything could work. You could try cutting two milk cartons in half. If you can’t find any of this laying around… I really hope you’ve got some dirt in your life. Red wigglers are what you want. We bought some off craigslist for $20…yup craigslist. Redwormcomposting.com sells one pound of red wigglers for $36. Now that you’ve got the supplies, you’re ready to build a nice cozy home for your worm friends. 1) Drill air holes in one of the bins. Choose one Rubbermaid bin. This will be where your worms live. Use the 1/8th” drill bit to drill 10-20 holes in the lid or upper sides, distributed evenly around. My worm bin stays outside so, to keep my worms from drowning when it rains, I put air holes under the lip of the container along side of the bin at the top, instead of in the lid. Drill 10-20 more holes around the sides equal distance from top to bottom. Place your chosen support materials at the bottom of the bin without air holes. Space them evenly so they’ll provide a stable base for the worm bin. Stack the bin with air holes (worm bin) on top of the supports. Check to make sure the air holes are visible and not being covered by the outside bin. If they are you’ll need to find some taller supports. 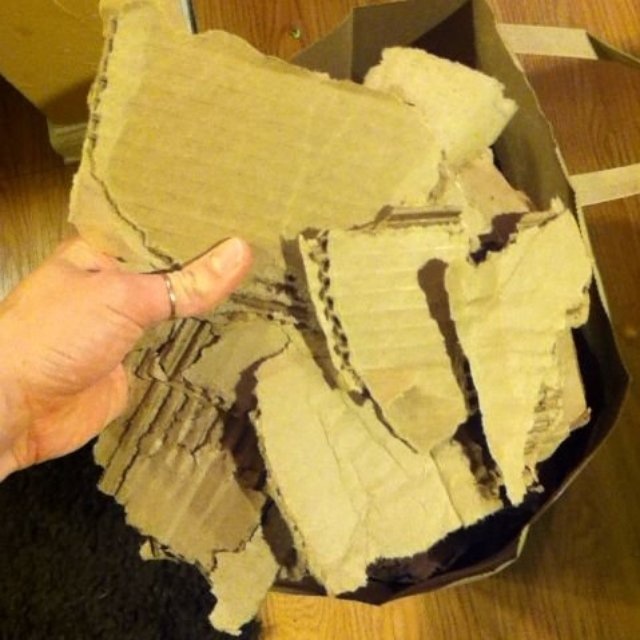 Shred the dry materials (cardboard, newspaper, etc) into small pieces. Add a layer of the bedding to the bottom of the bin with air holes. It needs to be a couple inches thick to create a comfortable environment for the worms. Lightly spray some water over the bedding to provide this layer with moisture. Put the lid on and wah-lah! You’ve got your very own worm bin! Some people recommend letting the bin sit without worms for 1-2 weeks to allow decomposition to start, the microbe community to develop and moisture levels to balance. If you’re going to let your bin sit for a while before adding your worms, hold off on ordering your worms. Once they arrive you’ll want to give them a nice home ASAP. Let us know if you have questions. Share this with your friends so we can all do our part to keep food scraps out of the landfill and nutrients in our plants. Subscribe to our email updates for more helpful tips!